Welcome to this introduction to the Human Design System. I’m Ra Uru Hu. I know that your interest is in what Human Design can do for you and if Human Design is truly for you, for the enhancement and enrichment of your individual experience. But first some background. In 1781, coincidental to Sir William Hershel’s discovery of the planet Uranus, a momentous event took place: The advent of the nine-centered being. Centeredness is a structural aspect of evolution. Neanderthals were 5-centered like modern Mammals, and so called Cro-Magnon or Homo sapiens were 7-centered beings. We are 9-centered. We are a transitional form, ‘Homo Sapien in Transitus’. Human Design is the knowledge of the mechanics of the 9-centered being. Since1987, we have been awakening to our nature and its extraordinary potential. 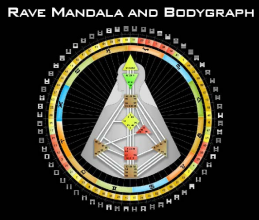 As fitting for a new evolutionary form, the Human Design System is a synthesis of past exoteric and esoteric knowledge integrated into a unique revolutionary mapping, the Rave Mandala and the Individual Rave BodyGraph. The Mandala is the imprinting matrix. Though based on the astrological wheel for the purpose of tracking the planets, there are 69,120 unique points of imprinting in the Rave Mandala. The inner wheel of the Mandala is divided into the 12 astrological constellations. The outer wheel is divided into 64 partitions, which are derived from the I’Ching and its 64 Hexagrams. This construct divides the wheel into genetic potentials. In Human Design, planetary imprinting is classified according to a position in a Gate. Every position within the arc of that gate has value. A gate has an arc of 5 degrees 37 minutes 30 seconds and each gate can be subdivided into Lines, Colors, Tones and Bases, giving 1080 unique points of value. Human Design is truly the Science of Differentiation. It is the Rave BodyGraph that transforms all these possibilities into the magic of a unique Individual Design. The BodyGraph is truly new: An extraordinary map to individual transformation, it is a synthesis. The bodygraph is built on Centers, or energy/information hubs. The Centers are rooted in the Hindu-Brahmin Chakra System, which used form principle mastery in the age of the seven centered being. 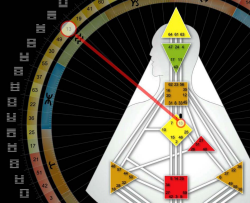 The connections between the Centers known in Design as ‘Channels’ are from the Sephiroth of Kabala and the Gates at either end of the Channels are from the I’Ching. It is the I’Ching Gates that are the key -through the Gates any activation of any position in the wheel can be translated to a position within the BodyGraph. In this way, Human Design calculations can translate an individual’s positional data into a unique BodyGraph configuration, your Rave Chart. The calculation of an individual Design begins with accurate birth time but unlike astrological calculation, an individual Design is based on two calculations. The nine-centered being is a binary consciousness. In Rave Cosmology, the totality called the Biverse is the by-product of a juxtaposed tension between Atomics and Dark Matter. According to the cosmology, in the beginning there were two Dark Matter ‘crystals’ that shattered and dispersed at the Big Bang: The Yin/Yang expressed through Design and Personality Crystals. The emergence of atomics also produced Neutrinos, the most abundant of all particles. The Neutrino Ocean, produced by all the living stars, is filtered by the Crystals of Consciousness. Every living thing is endowed with two crystals of consciousness: The Design crystal, an aspect of the original Yin, that transforms the neutrino data into the body and the life -and the Personality Crystal, an aspect of the original Yang that transforms the neutrino data into the potential of self-reflected consciousness. What binds the Biverse together binds us as well, which is the third and crucial element in the structure of a nine-centered being, the Magnetic Monopole. In our Design these three elements have specific locations within the body. The Magnetic Monopole sits in the sternum and holds us together in the illusion of our Separateness and gives us our direction for life. The Design Crystal sits within the skull and is the intelligence that operates and maintains the body. The Personality Crystal sits above the scalp and is the intelligence we recognize as ‘who we think we are’. 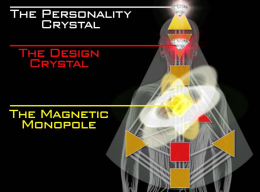 To illustrate this, you can look at the Design Crystal as the Vehicle (or Body), the Magnetic Monopole as the Driver and the Personality Crystal as the Passenger. One of the profound potentials in Human Design is the awakening of passenger consciousness. The two calculations in a Human Design chart display the imprint of each Crystal separately. In the Rave Chart, you see two sets of data on either side of the BodyGraph. On the right is the Personality data coded in black and on the left the Design data coded in red. At conception, the fetus is endowed with a Design Crystal that manifests the evolving form and a Magnetic Monopole that maintains its unique integrity and destiny. Only when the vehicle is ready does the Personality Crystal incarnate. This event takes place exactly 88 degrees of the Sun’s movement before birth, or approximately three months before the birth. 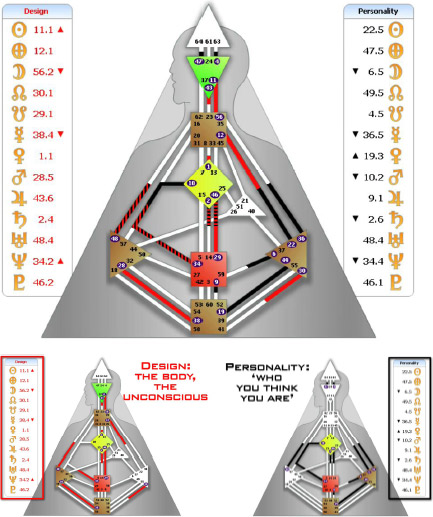 In a Human Design calculation the birth time calculation of the positions of the Sun/Earth and Lunar Nodes, Moon and planets form the Personality data base, the black, the ‘who you think you are’. Calculating backwards from the birth time 88 degrees of the movement of the Sun, the point arrived at is the basis for the second calculation of the planetary positions. This is the Design data base, the red, the body, the bio-genetic inheritance, the unconscious. Once the two calculations are complete and the positions of the imprinting objects indicated in the Rave Mandala, then the magic of a unique individual Design can emerge. The positions in the Gates of the wheel can then be transferred to the graph itself. This is illustrated by coloring in half of the Channels. The database comes alive in the Rave BodyGraph, which is a map. Imagine that each Center is a community and these communities are connected by roads and tunnels. The roads in black are what is conscious and the tunnels in red are what is unconscious. When Centers are connected to each other, when the Gates at either end of the Channel are activated, a Definition is formed. A Definition is what throughout the life will be reliable and consistent. Human Design is the Science of Differentiation. There are endless numbers of possibilities in the way in which BodyGraphs are configured. There are four different kinds of Definition: Single, which forms a continuous connection; split definition, where two areas of definition are separate from each other; triple split definition, with three separated areas; and the rare quadruple split definition, with four separate areas. Finally, there are those without definition. Most importantly Definition, or no Definition, leads to the core of Human Design knowledge and its value to you, as Type. Human Design is mechanical knowledge. The mechanics reveal that we are a binary consciousness. The graphing clearly indicates that we are a juxtaposition of two sets of data. Herein lays the dilemma and the greatest challenge of the emerging nine-centered being. We are all objects moving through a duality of this and that. Our seven centered ancestors were limited to a singular conscious, and relied exclusively on mind for decision making. Human Design is about transforming your life by making decisions as yourself, and it is not about mind. It is Type that reveals the mechanical Strategy and Authority derived not from your mind and its deep openness to conditioning but from your body, your vehicle, your Design consciousness. This is the great experiment that defines Human Design. Experiment with your Strategy & Authority. Free your mind to see and discover the beauty of your unique purpose. It all begins with Your Type. Humanity mechanically is divided into four Types: Manifestors, Generators, Projectors and Reflectors. Generators are the dominant Type on the planet with nearly 70% of the population. They are the driving life force of the planet. Their Strategy is to respond, and through response to find satisfaction and avoid frustration. They have an open and enveloping aura and are here to know themselves. Projectors are around 20% of the population. Their Strategy is to wait for the Invitation, to find success and avoid bitterness. They have a focused and absorbing aura and are here to understand the other. Manifestors are about 9% of the population. Their Strategy is to inform before they act, to find peace and avoid anger. They have a closed and repelling aura and are here to understand their impact on others. Reflectors are without Definition and are just over 1% of the population. Their Strategy is to wait a full cycle of the moon before making decisions, to find surprise and avoid disappointment. They have a resistant and sampling aura and are here to see difference. The quality and potential of your life is based on the decisions you make and the directions they lead to. 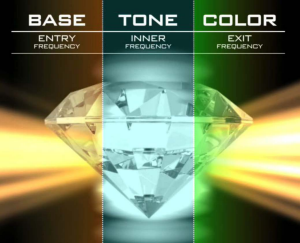 Look at any Rave Chart and you will see an obvious duality between what is activated and colored in and what is white and open. As humans we are ruled by the genetic imperative to be attracted to what we are not. This genetic law that maintains the health of the gene pool pulls us towards conditioning. Each open center has a not-self strategy that directly impacts mental decision making. For the majority of Human Beings, their minds are conditioned by their openness and this distorts their decision making. Your Strategy sidesteps this basic pitfall. In Human Design, as we are a binary consciousness, we are endowed with two Authorities: the inner Authority of the Body to determine the life and the outer Authority of mind to express unique awareness. In the conditioned being known as the “Not-Self”, the mind expresses both inner and outer Authority. A mind absorbed in the machinations of survival will always withhold some truth in its attempt to control its future. We are not here to be absorbed in survival consciousness. Your Strategy aligns your life to the correct geometry, eliminates resistance and offers the great challenge of awareness to your Personality. The most important step is to try the experiment for yourself. Discover your Design and transform your life. Change the way you make decisions. Through this experiment you will learn to honor your Strategy & Authority. It is the way to differentiation and the fulfillment of purpose.